Christmas on the remote Scottish island of Mure is bleak, stark - and incredibly beautiful. It's a time for hunkering down, getting cosy in front of whisky barrel wood fires, and enjoying a dram with the people you love - unless, of course, you're accidentally pregnant to your ex-boss, and don't know how to tell him. In what should be the season of peace and goodwill on earth, will Joel think Flora is a bearer of glad tidings? Meanwhile Saif, the doctor and refugee from war-torn Syria is trying to enjoy his first western Christmas with his sons - but without his missing wife. Can the little family possibly find comfort and joy? I honestly didn't think I was going to read a better book this year than The Endless Beach, the previous book set on Mure, but I think his is just as amazing if not even better. Annoyingly I can't say too much about any aspects of the plot, because this is book three in a series and I would wholeheartedly and enthusiastically recommend you read all three of these in order, to get the full emotional impact and to really care about the characters. Hence anything I say is likely to spoil your enjoyment of the first two. That being said just wow, I was almost in tears towards the end, and throughout I was continually compelled to read on. Flora and her family, and the island's doctor Saif will forever have a piece of my heart. There are some huge storylines going on, so in some respects its good that its set in December as it allowed some of the lightness of the festive season to shine through and there were some smiles to be had. Equally though the December setting on Mure was perfect as the darkness of the island at this time of year was so atmospheric, and really added to the mood especially with one particular plot line. Tripp was a rather interesting new character, I hated him at first, he has horrible views on things but the more time he spent on Mure, the more his horizons started to open and towards the end I at least liked the guy, and felt a bit sorry for him. He is related to someone on the island but that is all I am saying. 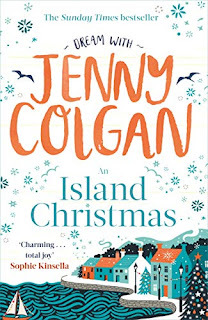 Between The Endless Beach and An Island Christmas these are without a doubt Jenny Colgan's best ever books, and if she continues to write in this more slightly grittier way with some heavier subjects in amongst the lightness, then I am incredibly excited to see what her next books are. I'm not sure I can find the words to express just how amazing this book truly is, but rest assured it is one rather special book, and definitely one worth reading whether you are a fan of the author or new to her. I desperately hope this isn't the last book set on Mure, but have a weird feeling it may be in which case, it is a great way to tie up a series, but I love the setting and characters so much that I really hope for more in the future.